This Week We're Saying With Pride Free Bradley Manning and No To Torture! Manning is the LGBT Army Private accused by the U.S. Government of leaking information to Wikileaks that revealed the extent of war crimes by the U.S. in Iraq and Afghanistan. 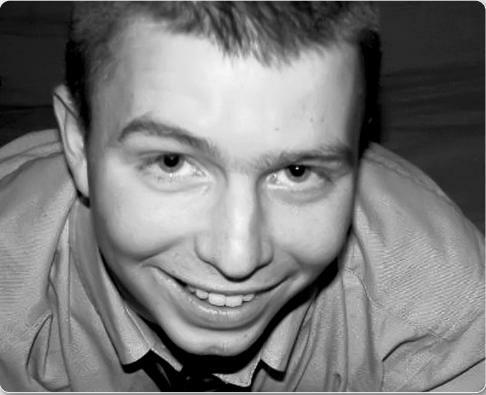 In our eyes Manning is a hero if he did as the government alleges because he exposed these heinous crimes to the world. He deserves our support. Tuesday, June 26, is the International Day of Support for Survivors of Torture, which will be marked in 20 cities in this country. Here in Chicago, we will honor the strength of survivors by demanding an end to torture by closing Tamms prison and justice for victims of Chicago police torture. The highlight will be a noon press conference at the State of Illinois Building (Randolph & Clark, Chicago) to demand that funding for the Illinois Torture Inquiry and Relief Commission is restored. This commission is the last hope for many prisoners who are victims of Jon Burge and his Chicago Police torture team. Speakers will include Rob Warden, Executive Director of the Center on Wrongful Convictions at Northwestern Law, and Neil Toppel, members of the Torture Commission. We also demand the closure of Tamms prison, where hundreds of men continue to suffer the torture of solitary confinement. A gathering in support of survivors will follow the press conference. The day will start at 8 am with banners at Hollywood & Sheridan and 57th & Lakeshore Drive, and a vigil at Occupy headquarters (LaSalle & Jackson, Loop). And it will culminate with a dinner and program hosted by the Heartland Alliance Marjorie Kovler Center at 6 pm at Coffey Hall, Loyola University, 1032 W. Sheridan Road, Chicago. The keynote address will be given by Jobi Petersen Cates, Director of the Midwest Region, Human Rights Watch. Please join us tomorrow, join our Facebook event and invite friends! Also Please continue to show your support of Gregory Koger! Stop the Vindictive Political Prosecution of Gregory Koger! · Stop the Vindictive Political Prosecution of Gregory Koger! · Videotaping is not a crime! · Former prisoners who stand up against injustice and oppression should be supported, not repressed! At an historical moment when people are stepping forward in dissent and protest around the world from Tunisia to Wall Street, political attacks on those who document these courageous acts are escalating. 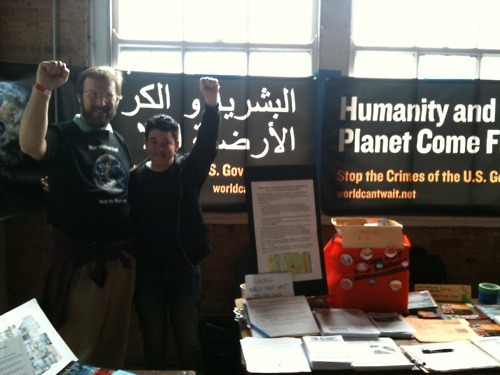 For nearly 3 years, Gregory Koger has been fighting a completely outrageous political prosecution and 300 day jail sentence for attempting to videotape a statement by Sunsara Taylor opposing the censorship of her talk prior to a public event at the Ethical Humanist Society of Chicago. This prosecution is premised on a dangerous reinterpretation of the trespass law, and the near-maximum sentence Gregory was given is an attack on all former prisoners who turn their lives around, as he has, and their right to challenge the injustices of this society. Sign the above statement here and donate to publish it here – thank you! Below is a list of events and actions that Chicago World Can’t Wait will be participating in along with other organizations during the National Week Against Torture. Please come out and join us! Vigil: Water Tower (Michigan and Chicago) – 9 a.m. to 4 p.m. Please JOIN the Facebook event page and invite friends! Beneath the Blindfold interweaves the personal stories of four torture survivors who now reside in the U.S., but originally hail from different parts of the globe: South and Central America, Africa, and the U.S.
Where: Federal Building, Jackson and Dearborn Sts. Posted in: Uncategorized. 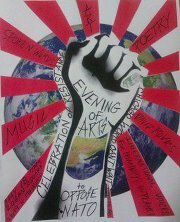 Tagged: Afghanistan, drones, NATO, night raids, Pakistan, protest U.S./NATO wars, remembering the victims of U.S./NATO wars. A day after U.S. veterans threw away service medals over a fence toward the NATO Summit, members of the wider community will gather to memorialize people killed in the U.S. occupations of Iraq and Afghanistan, and the U.S. drone attacks on Pakistan and Yemen. In support of the protest of NATO, Trinity Church has opened its lawn to expressions of grief and remembrance. 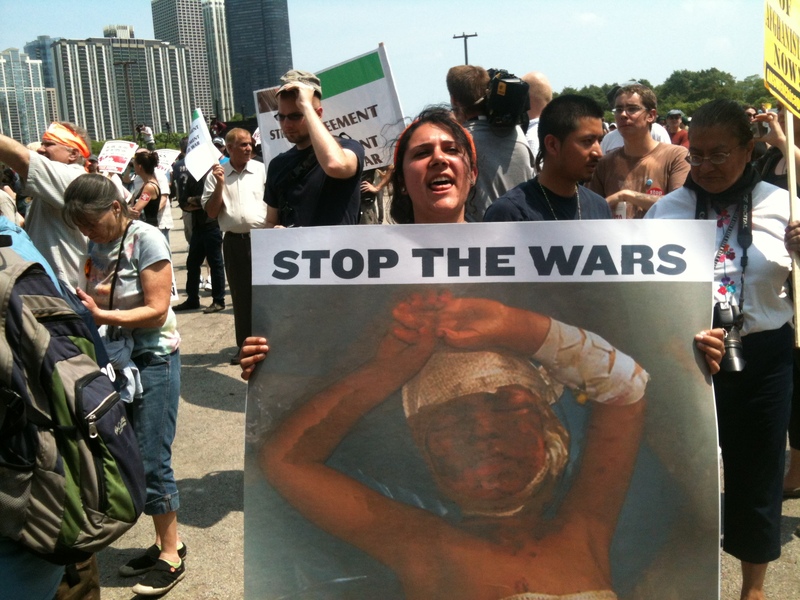 via We’re putting the focus on the victims of the US/NATO wars all week! : Day Time and Evening Activities and Events « Chicago World Can’t Wait. Posted in: Uncategorized. Tagged: Afghanistan, Barack Obama, Code Pink, NATO Protests, Veterans for Peace, War Crimes, World Can't Wait. 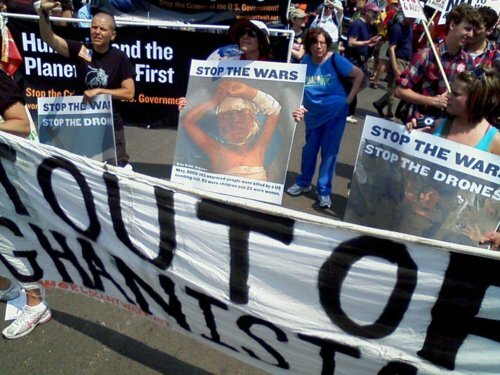 the NATO protests will attempt to present letters expressing outrage about NATO operations and a demand of an end to military operations, particularly drone operations, to four NATO countries: the United States, Canada, Germany and the UK. They will also bring visual representations of the civilians killed by NATO forces. More events all week long – let’s keep up the momentum: Spread the word and invite your friends to come along, learn about the crimes of NATO and get involved in the movement to put them to a stop. Tuesday – noon – Outside the Law – Andy Worthington film featuring the stories of the real people who have been subject to detention and abuse at black sites, Guantanamo, Bagram, etc in the course of the “war on terror”. Thursday – noon – Chicago 10 the story of the 1968 protests in Chicago and the conspiracy trial that followed: MUST SEE for all Chicago NATO Summit protesters! Friday – noon – The Bush Crimes Commission – documentary of 2005/6 hearings convened concerning the criminal aggression against Iraq, rendition, detention, and torture, culpability for Katrina crisis and more! 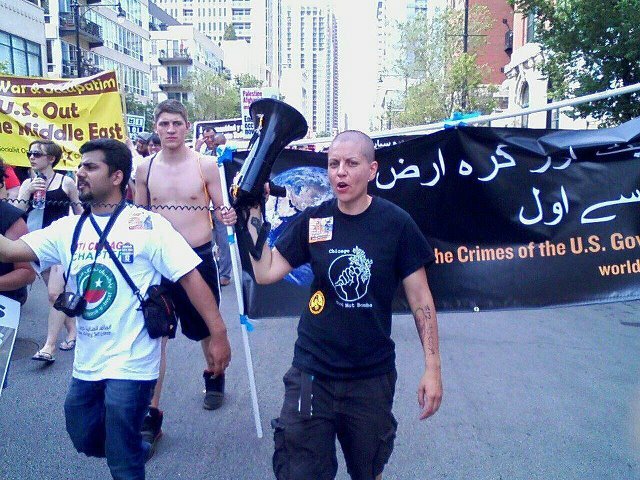 Join us in reaching out to people throughout Chicago with bold, visual outreach and help organize many more people to join us in protesting NATO this weekend. All you need to bring is yourself (and a friend, if possible). Meet us at 4 pm, everyday!! Call or text 773-739-3743 for more info. David Rovics and an acoustic set by rockers Outernational unplugged headline an evening of music, spoken word, and more celebrating our resistance! With speakers from countries targeted by NATO and the US. 7 pm, 615 W. Wellington Ave.
Singer/songwriter David Rovics and an acoustic set by rockers OUTERNATIONAL unplugged headline an evening of music, spoken word, and more celebrating our resistance! With American Friends Service Committee’s Windows & Mirrors exhibition of art from and about the war in Afghanistan on display and speakers from countries targeted by NATO and the US. Suggested donation $10 and up. 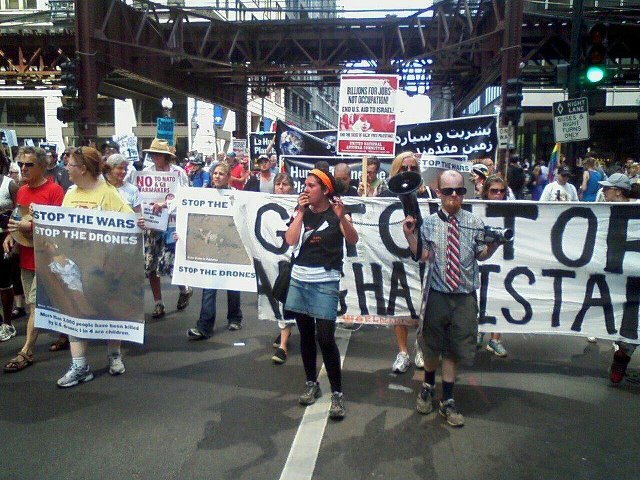 Your contributions will go towards supporting World Can’t Wait’s antiwar presence in the streets of Chicago this May, activating, energizing and mobilizing people around the message that Humanity and the Planet Come First. As the US and NATO attempt to justify the continuation of conventional and covert drone war in Afghanistan and around the world, we will be be there too, exposing their crimes through creative protest. Seating is limited, be sure to get your ticket(s) while they’re still available! Check out the presentations we’ll be representing at! 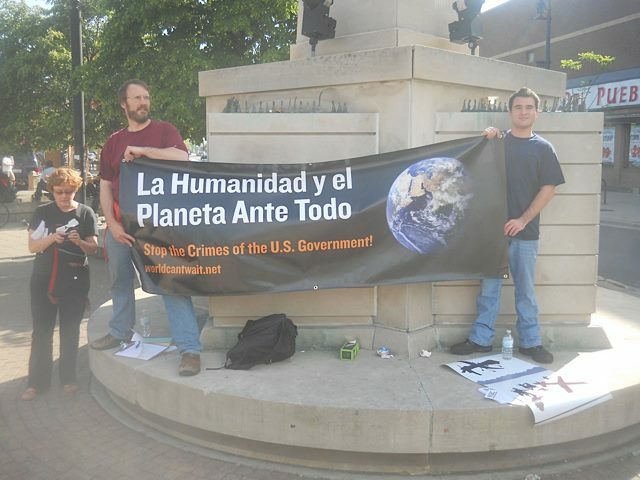 Defending Political Prisoners of U.S. Wars, Standing Up for Bradley Manning! G: NATO and Afghanistan: What’s Wrong with the “Good War”? via Revolution Books Chicago: EVENTS. Be sure to stop by our table. Check out the presentations we’ll be representing at! 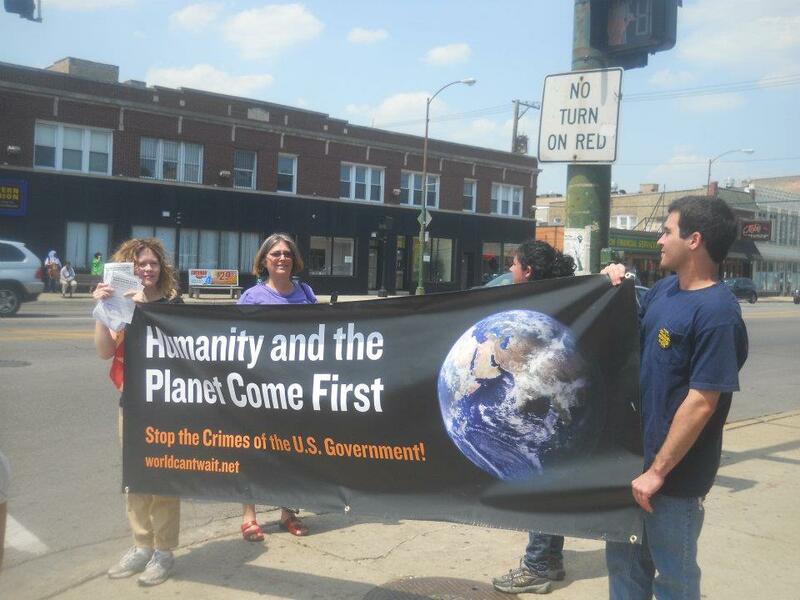 via May 12-21 Chicago WCW Righteous Daytime Activity and Radically Fun Night Time Events: How to Resist NATO « Chicago World Can’t Wait.